Staying in Gumi during weekends is somewhat boring, so we had planned on Friday to go to Seoul in weekend for ‘Hi Seoul’ festival. All plan went for a toss when Jason said on Friday evening “As usual we will be working tomorrow”. On Saturday when we were about to leave to office Jason called us and said no need to go office, as root cause of issue is found. He ended the call saying enjoy the weekend. After this we had lunch watching movie Gangster in Madam’s system. She also saw some part of the movie with excitement as the movie was shot in Korea. 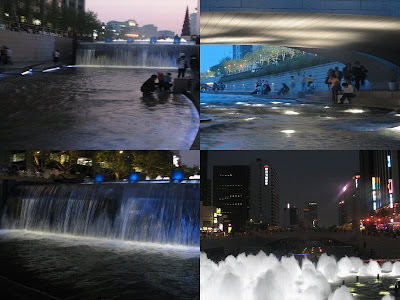 She identified one place as Cheong Gye Cheon ( a small stream in Seoul). She also showed the place in Seoul map. With the excitement I almost decided to leave to Seoul immediately. Subhajit said “relax, what will you do for accomdation?”. Then we decided that we can leave very early in morning on Sunday.I did all planning which train take at what time. Madhu prasanna(Madhu) of IFX agreed to come with us. Many people initially showed interest but looking at our plan, no one agreed to come by giving excuses that in one day no one can cover Seoul(In my opinion even one week in not enought to see Seoul completely). Morning I got up at 5 am, finished morning ablutions ASAP. Subhajit and Madhu also got ready. While going to catch Taxi Subhajit decided not to continue because of stomach ache. He didn’t want to travel in a bad condition. He asked us to carry on. Me and Madhu had to carry on, all efforts of getting up early in the morning should not go in vain. We rushed to Gumi station, as we had catch 6.25 am train. The Taxi driver took us in a short cut route and we reached in time at 6.20 am. We bought KTX thru tickets(28400 won per head) to Seoul via Daejeon. As soon as we reached the platform the train arrived. If we were late by 2-3 minutes we would have definitely missed the train. KTX travel(more in a separate post) was a memorable one. We reached Seoul at 8.45 am. We had a small photography session next to Train engine in Seoul Station. 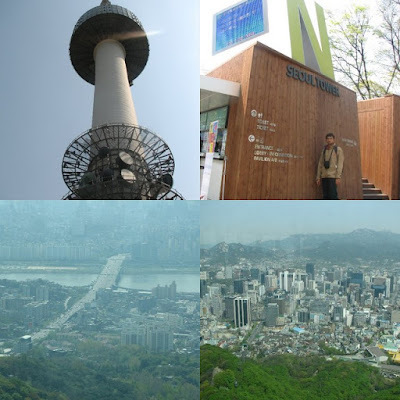 First we decided to go Seoul tower. In the process I explained Madhu how to use Seoul Metro, buy tickets etc. From Seoul Station we took metro to Myeongdan. From Myeongdan station we walked for 10 mins to Namsan Cable Car Dock. We reached there at 9.30 and found out that operating hours were from 10 am to 11 pm. So what to for half an hour? We decided have to snacks which we were carrying, also had coffee for 2000 won at a shop opposite to dock. The smell there was very bad, as they were preparing food of some insect. While moving in front of the shop we had hold our breath. At 10 am we went for buying tickets. There was a quiet long queue. Price of ticket for cable car was 4500 won one trip and 7000 won round trip. We took the round trip ticket. Seoul tower is atop Mt. Namsan. 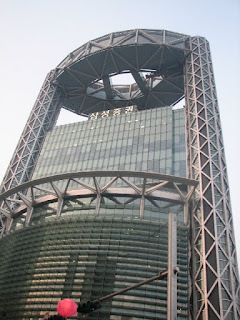 Near the base of tower, there is a skydeck. One can witness beautiful skyline of Seoul. 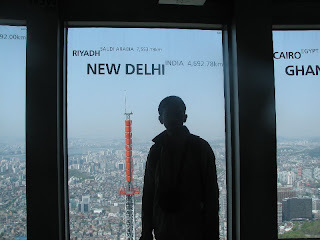 Later we found that we can to an observatory on the tower by paying 7000 won per head. There is an elevator to go to observatory. 360 degree view from observatory was good. For every 10 degree, on the glass panes, they had mention distance of a famous city from that point. Distance of New Delhi was 4692.78 km. Distances of other places North pole, South Pole were also mentioned. In other level of observatory, there was write-up about landmark place of Seoul Itaewon, Yeouido visible in that direction. I liked this concept and took snaps of many of such write-ups. 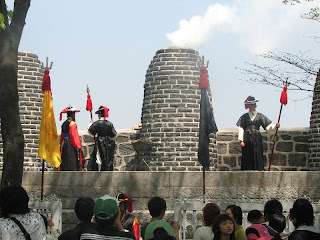 We came back to base of tower, saw something traditional thing happening for ‘Hi Seoul festival’. They were raising smoke in the smoke-station, this was used in olden days to indicate warning signals to inhabitants. Mt. Namsan has in fact historical significance too. After coming down we saw some beautiful fountain across the road. We took photos in front of the fountain. Then we saw procession far away happening for ‘Hi Seoul’ festival. In the process looking at procession our feet went into Namdaemun Market. There we enquired about prices about some items, prices were too much. 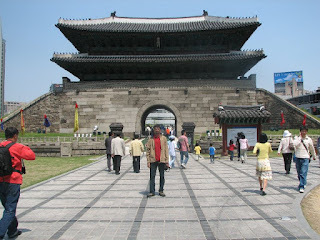 Then we saw famous Namdaemun Gate, took snaps in front of it. Later we continued window shopping in the market. Next to one of the shop we found brouchers of all destinations in Seoul. Only some were English, one of the brochure was about Cheong Gye Cheon(place which madam showed us in map previous day). We decided to add the place in to-see list. But first we had some more important business to do i.e. 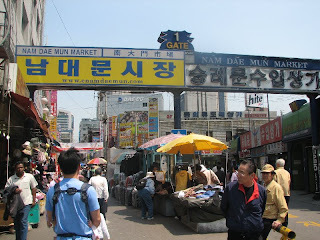 shopping at Yongsan Market. From nearby station “Heyong” (line-4), we took metro to “Yongsan”. There in I-Park mall, we bought external hard drive. Later, Madhu enquired about camera prices and ended up buying Canon-IXY. After shopping we had some juice and food. Next place to be covered was Cheong Gye Cheon. We took Metro from ‘Yongsan; to ‘City Hall’ Station. From the station we walked for 5 minutes and found some stage performance happening for ‘Hi Seoul’ festival. Here is a video of one of the stage performances. 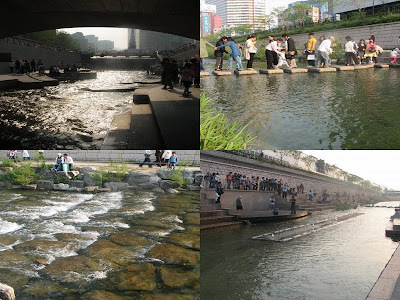 Initially we thought we are at some other place but later found out that it was beginning of Cheong Gye Cheon stream. This stream was a laundry site previously, was recently restored as a tourist destination. The walkway next to stream is around 5-6 km. There are 9 spots in the entire stretch and each has some significance. The skyscrapers on both side of the stream make walk more exciting. Time was 5 pm, we walked slowly initially taking as many photographs. Madhu was more enthusiastic clicking shutter with his new camera. One sequence of 'Tuhi Meri shab' was shot here. Later we found that we were running out of time, so we changed our gears and hurried through various spots. Reached to spot-8 'Jonchigyogak' at 6.30 pm. This spot was not as beautiful as shown in photo in the brochure, so were bit disappointed as we had slogged for last 1 hour reach this place. Since we didn’t had much time and also were tired, we took Taxi back to spot-1 of Cheong gye chon. As the road was closed we had to walk a bit to reach Cheonggye Plaza. While walking one building caught our attention, and we captured it in our camera. Time was 7 pm. It was getting dark. We waited for lights to come on. Finally at 7.30 pm lights were switched on and we captured the moments in our camera. At 7.45 pm we decided to leave, took metro from City Hall to Seoul Station. 8 pm we reached the station, bought ticket for 8.15 pm train to Gumi. Economy class tickets were not available, so we bought first class tickets, which were 4000 won per head more. The Samuel train seemed to be more slower after traveling by KTX in morning. At 11.25 pm we reached Gumi. Stood for 15 minutes in queue for Taxi and were back in guest house ending our successful trip. Have a look at picasa album of this trip. 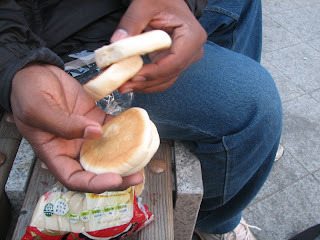 Before concluding it is important to mention about the food item with which we lived for entire trip. Chinese bun. Good that you have such an energy..
Hey, btw, try flickr.. for some reason (may be it does some image enhancements) pics look really good on flickr.